A silvery, spiny-rayed fish with several dark, horizontal streaks along the sides. Streaks often discontinuous. A sharp spine is present on the gill cover. Spinous and soft parts of dorsal fin entirely separate. Lower jaw projects beyond upper jaw. Anglers find hybrids strong, hard-hitting fish—“monster white bass.” If you are fishing for white bass and are unprepared for hybrids, they are easily capable of breaking the fishing line or throwing or destroying the lure. Thus heavier tackle is called for than one would use for white bass. Weight: about 7-10 pounds; maximum 15-20 pounds. 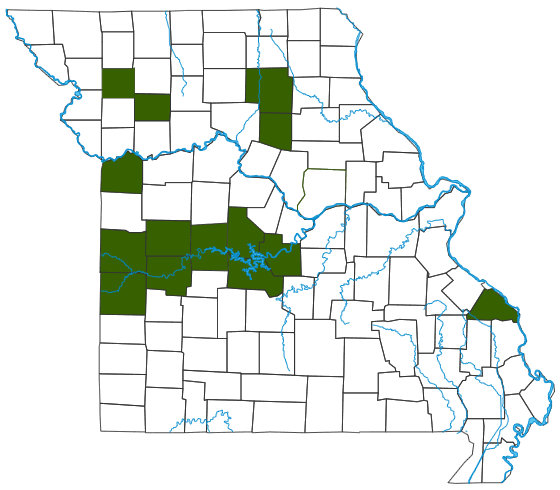 Large reservoirs; some also occur in the Osage River below the Lake of the Ozarks. The MDC started stocking hybrids into select Missouri waters in the 1980s. Hybrids appear to be attracted to flowing water, as in the tailwaters below dams while water is exiting the dam, and near natural springs and the mouths of feeder creeks after heavy rains. Hybrids tend to frequent areas that are beside the fastest water. Small and medium-sized fish, crustaceans and various aquatic insects. Gizzard shad are an important staple, and hybrid striped bass play an important role in limiting the numbers of large gizzard shad in reservoirs. Wipers are currently stocked in Lake of the Ozarks, Truman Lake, Thomas Hill Reservoir and Blue Springs Lake. Because some of the fish pass through Bagnell Dam, hybrids may be found in the Osage River below Lake of the Ozarks. The MDC produces hybrid striped bass in hatcheries by fertilizing the eggs of the introduced striped bass with the sperm of native white bass. The young fish are then grown to stocking size in ponds prior to release into select Missouri waters. In spring, hybrids travel up tributary streams with white bass, but the hybrids are sterile and cannot reproduce. Their populations are replenished by continued stocking. Fishing is a big industry in Missouri, and the large size and fight of wipers makes them popular sport and trophy fish. They are also an excellent food fish. Missouri industries related to fishing include tourism, lodging and restaurants, boat manufacture and production and sales of cold beverages. In our large reservoirs, gizzard shad can grow too large to be eaten by most other sportfish, but hybrid striped bass can consume and therefore limit the numbers of those large shad. About the only other large predators that can take these shad are flathead catfish and muskellunge.